[toc]If your cold and cough is getting worse than ever, you’re feeling tired and chest pain, probably you have caught bronchitis. Anyone who is suffering from it knows what pain it can cause. 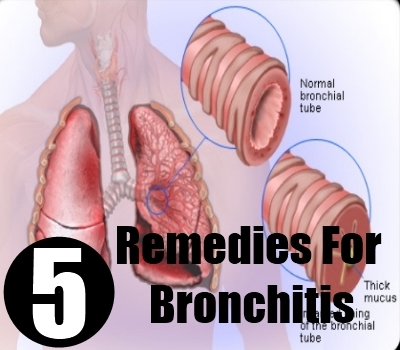 Bronchitis simply means inflammation, swelling or infection of the bronchial tubes. The bronchial tubes are present between the nose and the lungs. It is broadly classified into two types acute and chronic. Normally, bronchitis is caused by viruses and bacteria, the ones that lead to cold and cough. Similarly, people with low immunity are likely to get infected with this. Also, any kind of lung infection may also lead to bronchitis. Wheezing, shortness of breath, chest tightness, fatigue, persistent cough are a few symptoms of bronchitis. Usually, people suffering from this rush to get over-the-counter medicine but these hardly work and cure bronchitis. Here, we have for you a list of best chosen home remedies to fight off the infection sitting right at home. The remedies mentioned are simple and safe to use. Ginger is known to have a host of medicinal properties and has been used since a long time to cure common ailments and diseases. Ginger is useful to cure common cold and works for bronchitis too. 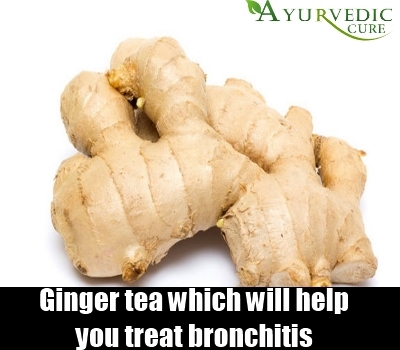 You can have ginger tea which will help you treat bronchitis and is beneficial for overall health of the body too. Add 1tsp of ginger powder and black pepper to a cup of boiling water. Let it steep for 5-10mins, lastly add some honey and drink this twice a day. When suffering from bronchitis, one should have as much as liquids possible. Mainly because this will keep the throat fluid and thus it will be easy to expel the mucus. Have particularly warm liquids like soup or tea. This will soothe the irritated throat that may result from continuous coughing. This oil is not meant to be taken internally. Put 5-10 drops in a hot water bath and do deep breathing in the steam to relieve chest congestion. To use it in other way, mix it with neem, olive or coconut oil and rub it on your chest and throat, this will provide instant relief. 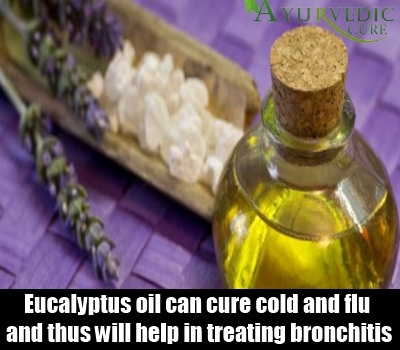 Eucalyptus contains cineole, which can cure cold and flu and thus will help in treating bronchitis too. Add 1tsp of salt to a glass of warm water and use it to gargle several times a day. This will soothe the inflammation of the throat. Also, it will cut through some of the mucus that may be irritating the throat. Be careful not to use too much of salt as it may cause burning sensation in the throat and too little would be ineffective. Be sure to spit out the water after gargling. Honey has got anti-viral and anti-bacterial properties, which is normally used to cure cough that comes with bronchitis. It will also strengthen your immune system. You can use honey by adding 1tsp to your regular tea. 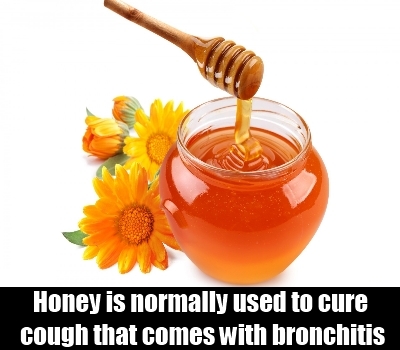 Also, honey taken with lemon water is a good option and a natural way to cure bronchitis. These simple home remedies are easily available and safe to use. Try them to fight off bronchitis and stay healthy always!